Get your tickets to a limited time only performance! The Colorado River is revealing its secrets and offering up gifts we could not previously have imagined! I’m here to encourage one and all to take a drive up Hwy 128 (River Road) and even better, float back to town. In a raft, a kayak, or on a paddle board…get on that river one way or another because this is your front row ticket to a rare and spectacular show! Guests from Denmark frolic in a new, naturally created swimming hole along the Colorado River. Cool thing about this summer is, for the first time in many years I, Swirlin’ Eddy, and my home River, the world-famous Colorado, are staging a special performance for you. There is less water in this river than usual, and as a result we are, so to speak, lifting our skirts and showing you the underside. River features usually hidden under water are revealing themselves to river fans and geologists alike. Rocks …totally rock. The Colorado has also begun offering glimpses of some of the giant boulders that form the contours we have only seen as hydraulic features on its surface. Folks who have been running this river for years are finding answers to some long lingering questions about what makes the water do what it does, because for a limited time only we can see what’s rising up from the bottom. As the season progresses, sandy beaches a-bound and picnic areas are easier to come by than last year. And the wildlife! Another bonus to river floaters is that in this particularly dry year more animals than we can recall in recent times are making their way to the river banks for a drink. On a recent Wild West Voyages day trip, the group saw a bald eagle, a coyote, several great blue herons, a river otter and a whole herd of big horn sheep (including young ‘uns). Now this was a particularly amazing day, but it’s happening more and more as we head into the heat of summer. Alternative water levels mean new currents and new sand bars in new designs. 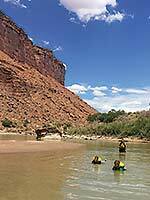 Recent travelers down our local Fisher Towers section have been frolicking in a new swimming hole protected by a developing sandbar on river left. 2018 offers us its own special version of the River that we may not see again for quite a while. Go see this limited time performance. Get your PFD (aka flotation vest) buckled tight, get out there, and go see the show! Wild West Voyages specializes in family-friendly guided day tours on the Colorado River near Moab, Utah. Call them for rafting, kayaking, and Stand Up Paddle tours, rentals, or river shuttle service.